Your BMW deserves the best treatment for bringing that little luxury in your life, which you always craved for as a car enthusiast. So, rather than any ordinary subwoofer box, go for one that is professionally built and promises optimum sound performance out of your car’s sound system. 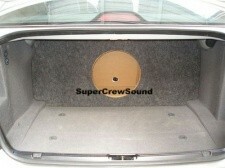 At SuperCrewSound, we have the best car subwoofers boxes available for BMW 3 Series and BMW 5 Series. All our BMW Subwoofer boxes are constructed with the highest quality MDF which meets strict quality standards. Some of their features include – precise manufacturing, attractive finish, easy maintenance, and quick installation. We build all our subwoofer boxes to order, which means they are made to precisely fit into your car and get flawless speaker performance. All you need to do is share with us the kind of BMW3 or BMW 5 Series Subwoofer you want. We have a team of seasoned professionals who will design an enclosure to suit your exact needs. We also offer Money Back “Perfect Fit Guarantee” on all our subwoofer boxes & other car and truck audio enclosures. So, in case you aren’t satisfied with your subwoofer enclosure’s fit, we will happily accept a return for a full refund. To know more about any of the products listed above, feel free to call us at (877) 424 0979. We will be happy to assist you with your needs, queries, and concerns.